Maurizio grew up in Genova, Italy. At an early age he began actively traveling the spiritual path, exploring the practices of Zen Buddhism, Transcendental Meditation, Yogic philosophy, Catholicism and Philosophy. In 1985, he came to the USA on a 98 year-old sailing boat and started working as an actor, model, and then filmmaker in NYC. But his thirst for knowledge was never satisfied, until he encountered “I Am That” in 2001 while shooting the documentary “Short Cut to Nirvana” in India. He has experience in all aspects of production both in front of and behind the camera, including acting, directing, cinematography, and distribution. Zaya has degrees in Engineering, Environmental Science, and Film. Born in Bulgaria, she produced and directed several award wining documentaries in Europe and the USA, including Energy for Survival, Hunger Gathering, Airwaves, Wings and Strings, Screeming Queens, America's Chemical Angels and more. Before developing ScienceAndNonduality Zaya has been also working as a Senior Web Designer/Multimedia Producer for multiple companies and clients including IDG BBC, IBM, KQED, NRC, Chreschendo Studios, Palo Alto Media Center, SFSU . Zaya is experienced in all aspects of Web multimedia production, from format conception, shooting, editing, encoding and publishing videos on the web. Zaya’s dream is to create media that will contribute to the expansion of human awareness and deeper inner silence. Since 2008 her focus has fully shifted toward creating a container in which a new spirituality can be evolving, outside of dogma, while creating media to express this evolution. Nick Day is an award-winning filmmaker and screenwriter originally from the UK. He studied cinema at the British Film Institute and trained and worked as a video editor in London before relocating to New York City in the late 1980s. His production and editing credits include a diverse range of documentaries, commercials, corporate presentations, and news features for international clients such as RAI Italy, Globosat Brazil, ZDF Germany and Channel 4 UK. 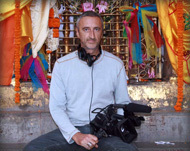 Nick co-directed and produced the award-winning documentary Short Cut to Nirvana, which played in theaters across the US and Europe. He has also written several screenplays, including The Fallen, a WWII drama which won him a screenwriter's award. Nick currently serves on the board of HealthShare International as its vice president. In addition, he has worked with various Tibet support groups, helping to build two schools for Tibetan refugees in Nepal and India. His other interests include world travel, mountain hiking, cinema, and teaching himself music composition. As part of his lifelong exploration into human consciousness, he recently trained as a hypnotist. Philip is an Italian-American filmmaker who grew up in Rome and relocated to San Francisco in 1994 to pursue Film Studies. He collaborated with several cutting edge Bay Area production companies, and award winning filmmakers, and in 2004 his documentary “Burning Man – The Floating World” won the Best Documentary Award at the DIGIT Festival in NY. Philip's dream is to direct documentaries that will expand people’s consciousness, and promote social, cultural and environmental change. He currently works mainly in the HD realm as freelance cameraman and editor. Other interests include photo-journalism, alternative cultures and new musical styles, photography, Nature and magic.